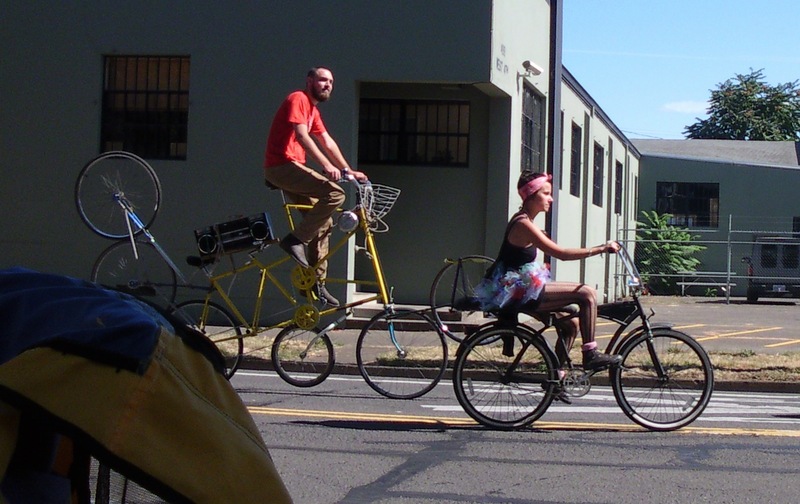 So the whole family went down to the Sunday Streets thing. Me, Sharrow, the two urchins. Sunday Streets is when they banned cars from Fifth Avenue for four hours and let us riff-raff have the run of the place. Wagons, pedal-powered frozen-yogurt carts, people going every which way. It was almost like a Third World country. Has this guy got a care in the world? Still, I wonder if it’s appropriate to be doing this right in front of the county jail? Ah, well. Some of us, you know, had greater things on our minds. More important things. Earth-saving things. 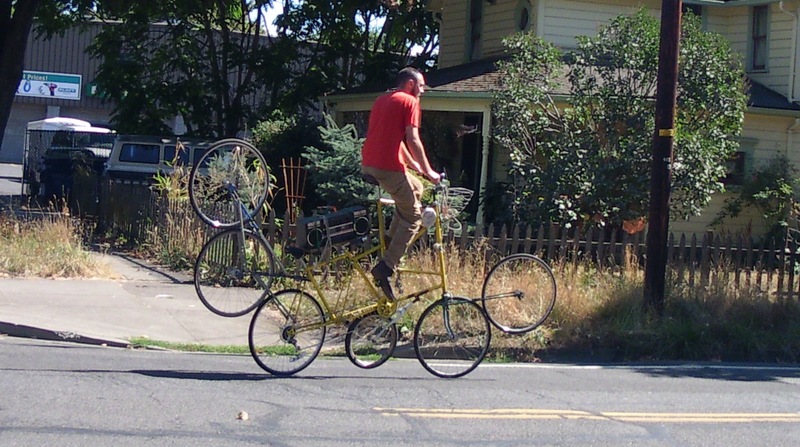 Some of us think we should stop goofing off and consider the deeper philosophical underpinnings of this Sunday Streets frivolity. For one thing, I hope you realize that this was a test run. The day will come when we exit the Age of Oil. And when it does come, those who kept their heads, those who mustered all their energy and ingenuity to engineer the Technologies of the Future, those will be the people laughing then. What does this fantastical contraption do? We aren’t sure. But in a world without oil, it’s going to be worth billions, that’s what we think. I know these are hard things to think about. Even I needed to take a break from it sometimes. So I’m glad I came upon the Red Wagon ice cream cart. 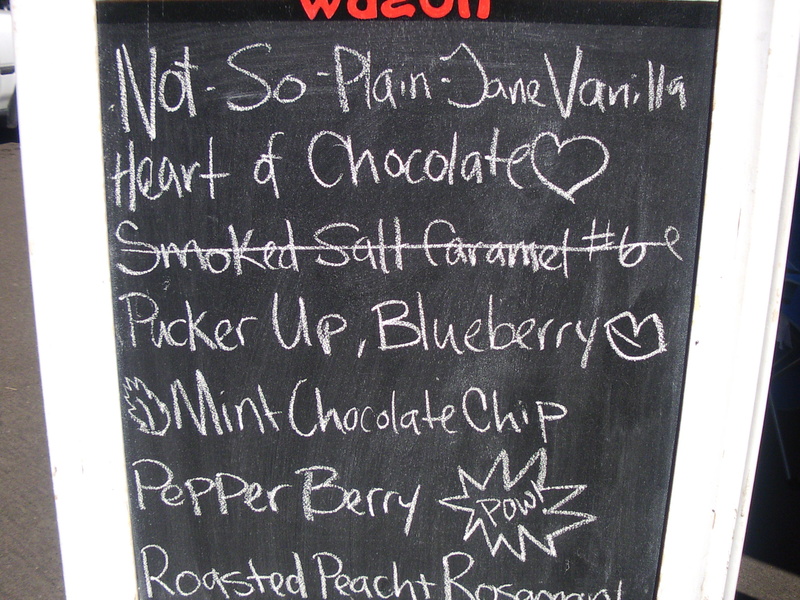 If you came upon the Red Wagon ice cream cart and found they were out of Smoked Salted Caramel #6, well, I’m really sorry about that. I got the last one. It’s really good. And they always run out. Oh, wait. What have we here? Mickey Mouse upside down? A circus trick about to happen? No, no. When the Age of Oil is kaput and you no longer have to drive around looking for a parking spot, you will need new hobbies to kill all the spare time on your hands. 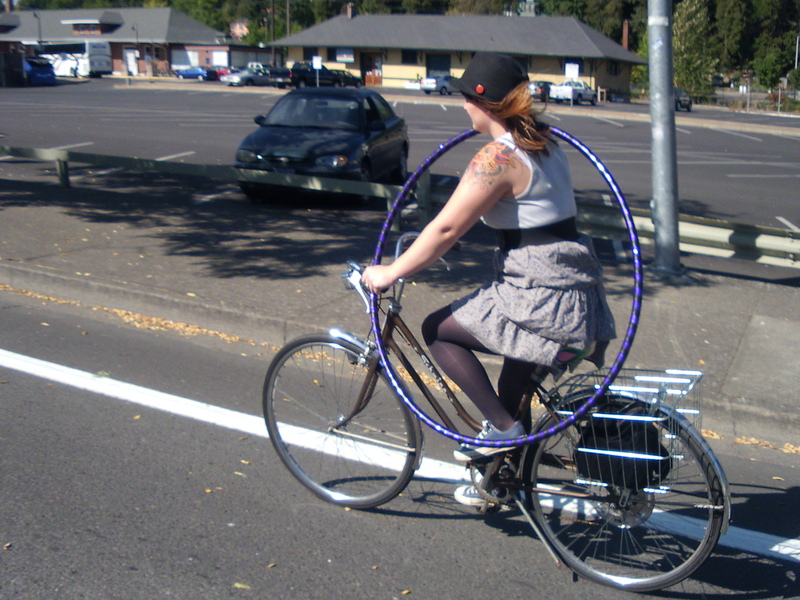 Hula hoops. Juggling. Stilt walking. Maybe painting images of the Virgin Mary on the head of a pin. Those kinds of things. 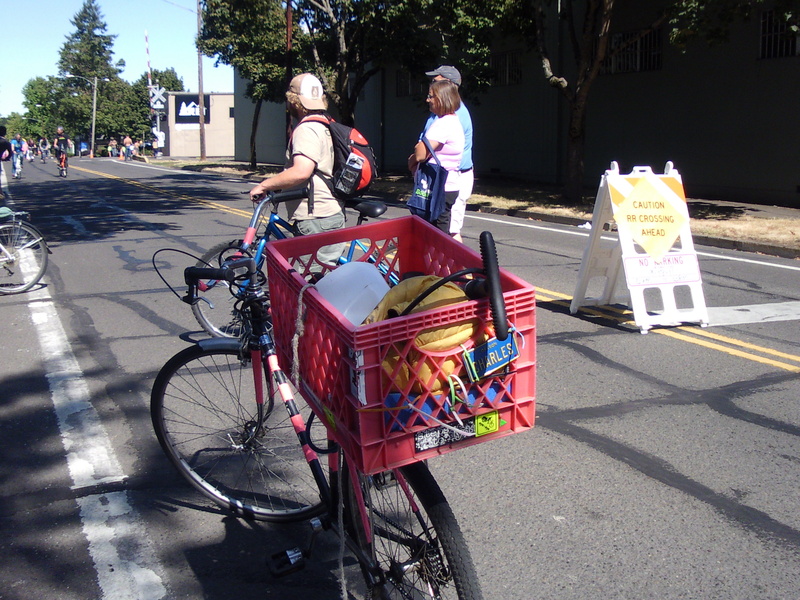 Charles was featured in Le Tour de Milk Crate. He was at Sunday Streets giving balloon animals to kids. When he wasn’t looking I dropped a Team Crate T-shirt into his crate. Sunday Streets just puts you in that kind of mood. I love the whimsy. I had to look up a concrete definition – the quality of being slightly odd or playfully humorous, especially in an endearing way. Love your blog. By the way I’m working on this year’s Christmas gifts (we do a family lottery and only gift one person) and I really need a Team Crate T-shirt. Catch you sometime for the purchase. Red Wagon is at the Springfield Farmers Market every week, I’ve become an addict. I was happy to see Betty Rocker there too. 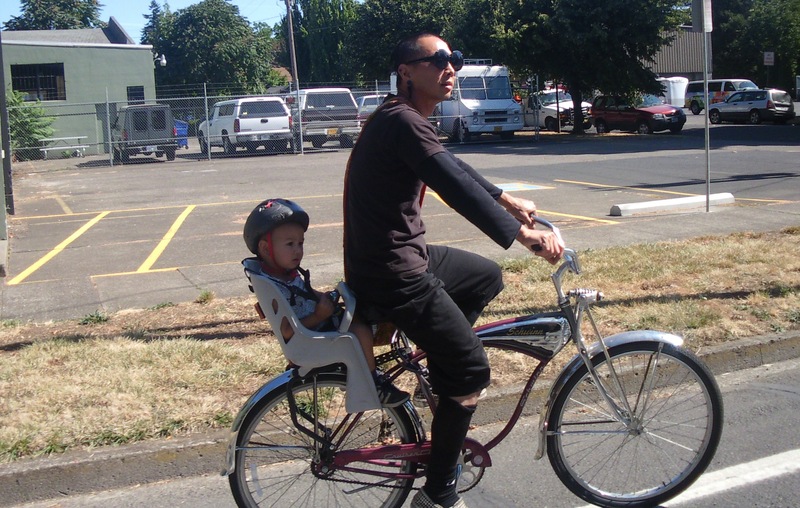 It had a different feel than the one Sunday Parkways thing I’ve been to in Portland. I think the larger mass of people in Portland kept things a little more organized, and the residential streets were more interesting to see. It was fun the way the residents would set up sprinklers to ride through or lemonade stands or whatever – it felt like they were sharing their neighborhood. Of course, I forgot about the map and didn’t realize I could follow 5th through down into the Whiteaker hood – so I might have missed the part I would have liked best. Indeed. You’d think this was Copenhagen or something. Geez, people. Another cheap (expensive) PR stunt to convince people the powers that be give a rat’s heinie about cycling in this town. Meanwhile, drivers in town (and the neighboring one) continue to mow us down in hecatombs. How whimsical is THAT? It’s been weeks since anyone’d been killed! I think we can credit the clearly causal relationship between not wearing helmets and less cyclists getting hit by cars. 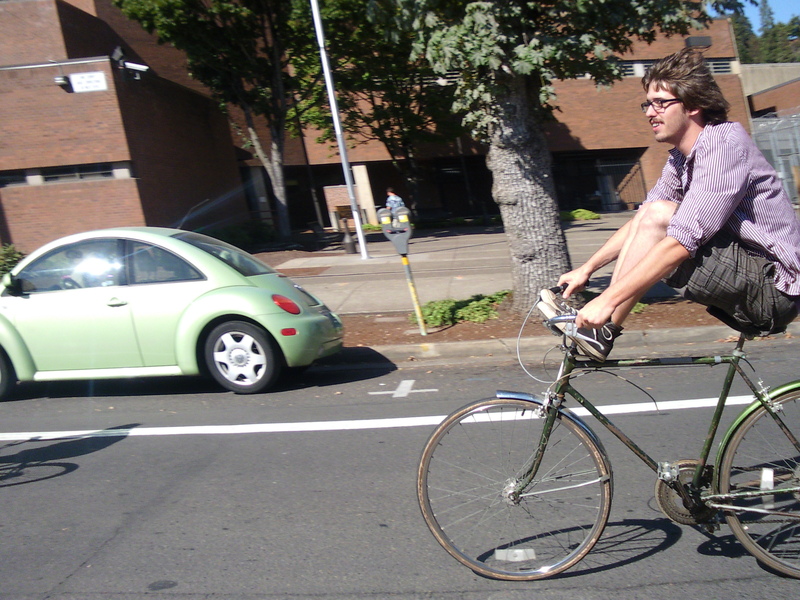 Oh, I have a new local celebrity cyclist, an older lady who rides down Franklin by campus on a dutch looking bike. I’ve seen her a few times, and I’m always both frightened and impressed. Um, wasn’t the whole point of Sunday Streets that the streets were blocked off from cars so that people wouldn’t have to be worried about getting hit by a car? And there were a lot of pedestrians too, so that would preclude going real fast. In that environment, what would be the point of a helmet, except to make a statement about helmets? I’m not arguing for or against helmets (I have one), I’m saying that before people spout off about lack of helmets they might pay attention to the context.